Chaplain Kate Braestrup, the New York Times bestselling author of Here If You Need Me, has written a compelling new book on prayer for which her devoted fans have been clamoring. 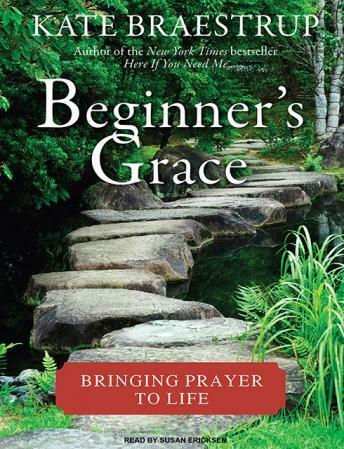 Beautifully written, with her astonishing signature stories of faith in action in real life, Beginner's Grace explains how to tap into grace with prayer-as well as how to pray, when to pray, and what to pray. Love is Grace. You can't earn it. But you can always find it when you need it. The tried-and-true way to grace is through prayer-even through a simple 'saying grace' before dinner. Yet in spite of hundreds of traditions and teachings about prayer, millions of people worldwide are unsure how to pray, or afraid they'll do it wrong, or worried that they won't be heard. Writing in the beautiful, honest, personal narrative style of her previous two books, Braestrup explains the many ways we can pray, including where and when to pray, individually and as a family. She includes numerous examples of prayers to draw from-beginning with grace, a brief prayer of thanks. Braestrup offers listeners prayers for situations in which their own words might fail them-from grief and loss to a request for assistance from God-and offers suggestions for making prayers more meaningful and satisfying. And she invites listeners to explore forms of prayer that extend into the wider community, including prayer for those whom we don't like and with whom we may disagree.